If you have been following along on the Seed Starting Series, your seeds will have been planted in homemade starters or store bought containers and germinated. Those baby plants may not be ready to hit the harsh outdoors yet but they do need to have enough light. 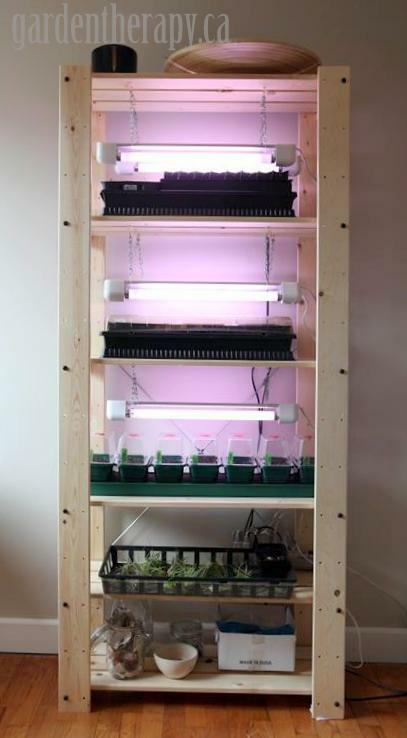 This weekend project will help you fashion your very own indoor grow op with an inexpensive Ikea shelving unit and some utility lighting. 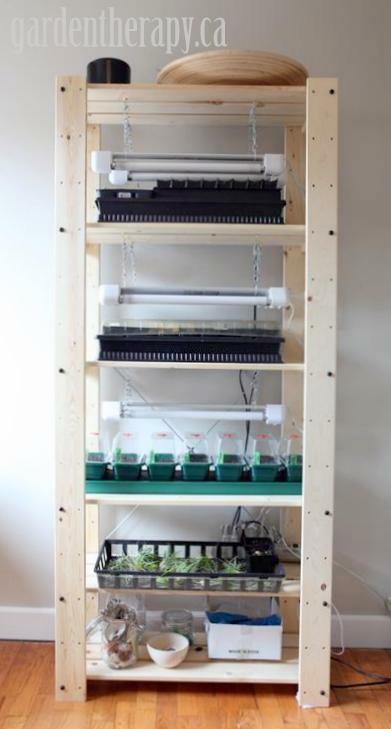 In past years I have used a 4-tier wire shelf which allows me to grow 8 trays of seedlings into large plants as I can continuously move the shelves to make more room for taller plants. Plus it comes with a greenhouse cover that makes the perfect transition to the outdoors to harden off seedlings. 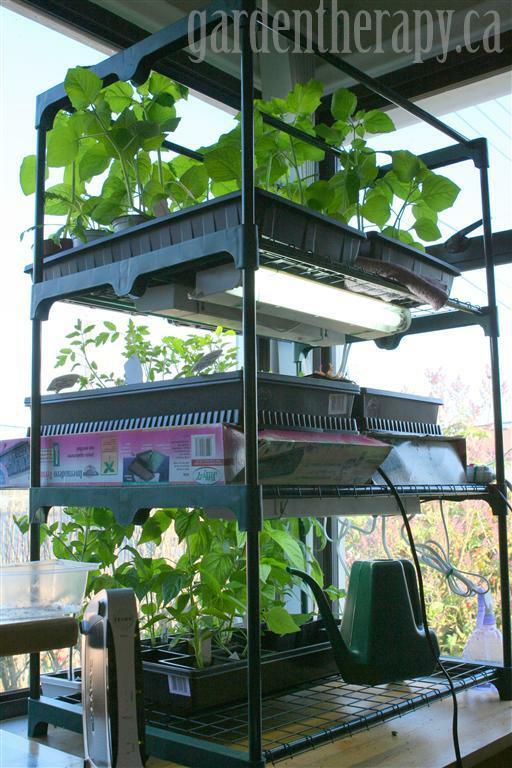 I still plan to use the 4-tier wire shelf as an outdoor greenhouse when I pot up the seedlings into larger pots. I decided that this year I would make something a little neater for the starts as the shelf is in a prominent place in our office. Plus I need more room indoors for my air plants and terrariums. I’ve seen the GORM shelf used for a few projects by fabulously stylish gardeners and this year I decided to give it a try. 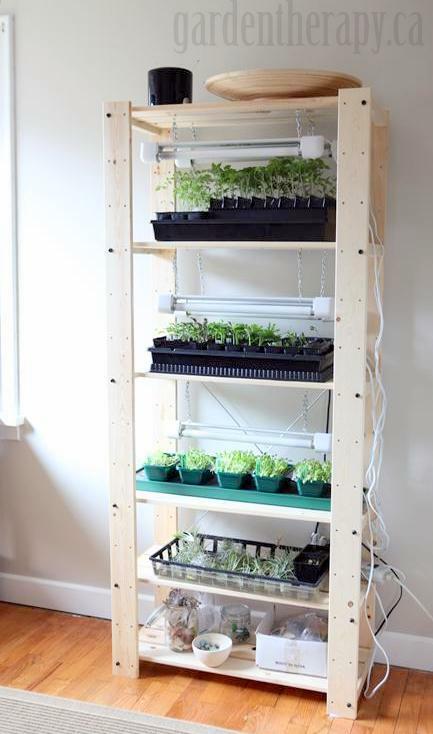 Carrie from Read Between the Limes’s $29.99 IKEA Seed Starting Rack was the inspiration for this project. Her shelf has fewer lights and adorable labels for her seeds and soil supply. 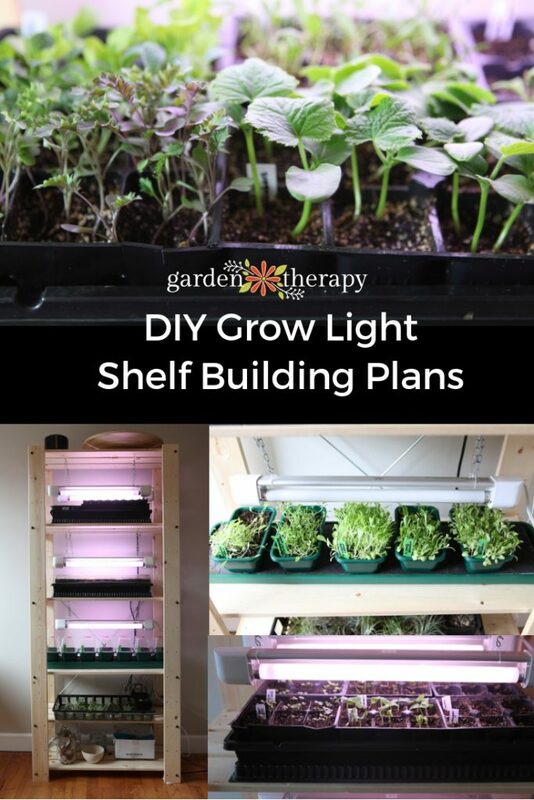 Make sure you check out Carrie’s blog for the instructions on how she set up her shelf and lots of great ideas on gardening with kids. 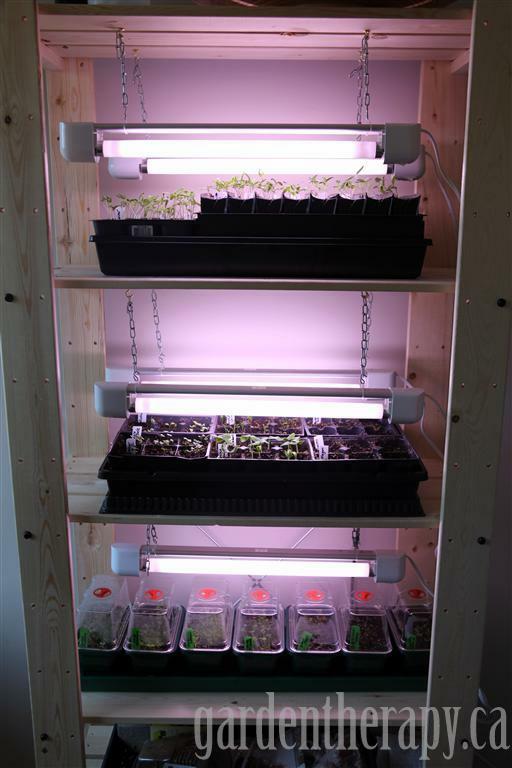 I added to Carrie’s set up by using 6 lights on the top three shelves which has been the perfect amount of light to prevent the seedlings from becoming too leggy. Disclaimer: I had to leave the seedlings in a bright window for 3 days while I visited the Tulip Festival, so they did get somewhat leggy. Tall, spindly (aka leggy) seedlings do not give your plants a great start. It’s not the end of the world, but it indicates that the plants are not getting enough light which is stressful for the plant. Growing really tall and skinny can cause the plants to flop over and break or easily be damaged. If you have leggy plants, re-pot them in deeper pots with the soil line all the way up to the seed leaves (the first leaves that appeared when they sprouted). All that extra stem can be tucked under the soil for protection and the leaves will have a fresh start. The best remedy for leggyness is to provide enough light and the right kind of light. 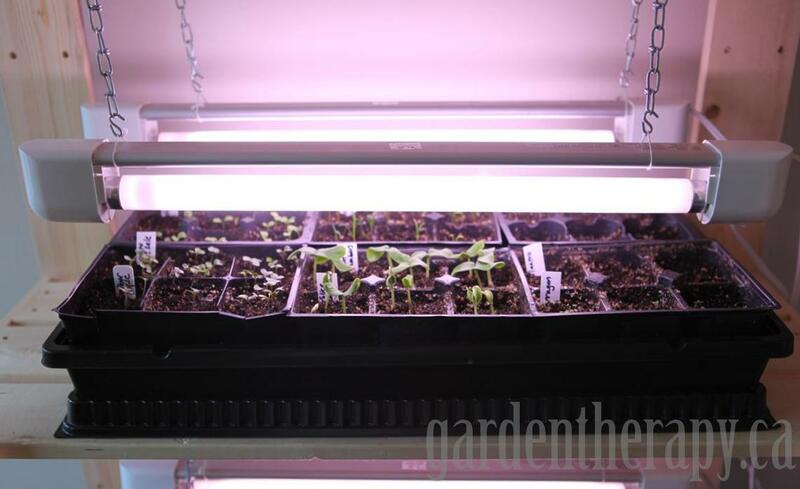 For most home growers wanting to start a few seedlings, standard florescent utility lights work just fine. If you can find inexpensive lights specifically made for growing plants, they may have a high colour temperature that more closely mimics the sun (and they are pink!). These can be very expensive and for the price the results are not that much different than standard florescent bulbs so save your bucks and buy a “daylight” bulb instead. 1 GORM Shelving Unit assembled as per instructions with 2 extra shelves. 1. Assemble shelving unit as per instructions. Space top 3 shelves 15” apart; these will be your growing shelves. Space remaining 2 shelves as you desire from the bottom; these will be supply shelves. 2. Screw 2 hooks to the underside on both the front and back board, spaced 2” in from the width of the lights. 3. 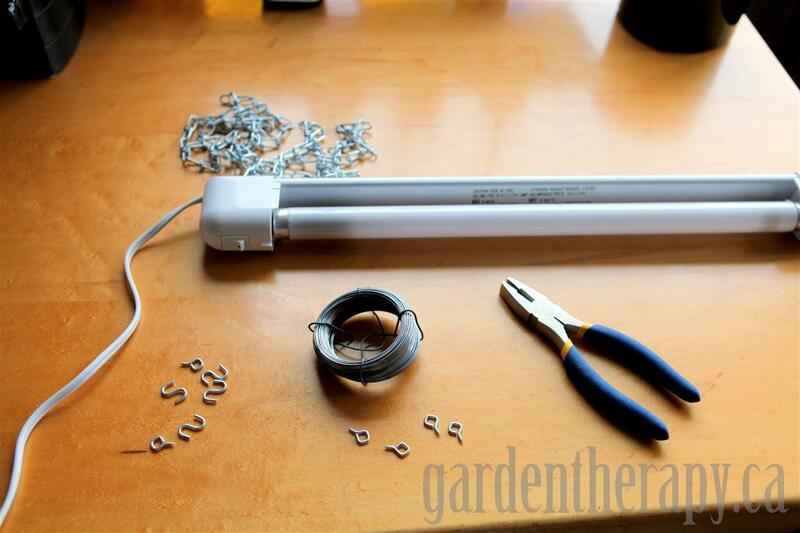 Tie wire or string around the light and affix the end of a length of chain to each side. Simply hang the other end of the wires on the hooks at about 1” above the seedlings. Continue to raise the lights as the seedlings grow. 4. I plug all the lights into a power bar so that I can easily turn on or off the whole thing with one switch. Start by giving your seedlings 8 hours of light a day and slowly increase to 12 hours. This mimics the increase in light the plants get as the seasons change and the days get longer. 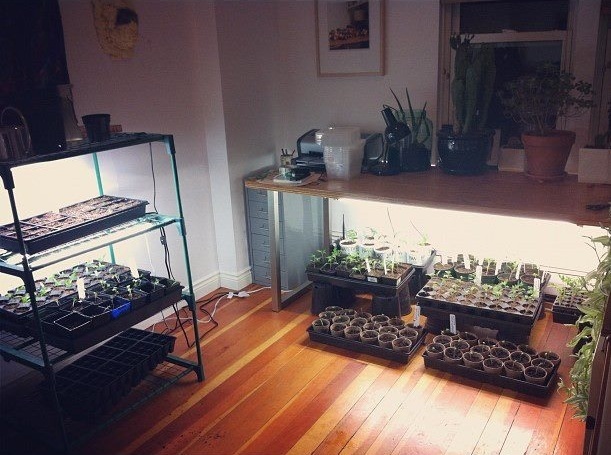 Now don’t think you must have a dedicated area specifically for seed starting indoors. My friend Sam sent me some great photos of the Victory Garden’s office where they have seeds growing all over the place. I particularly love them growing under the desk – what a smart use of space! 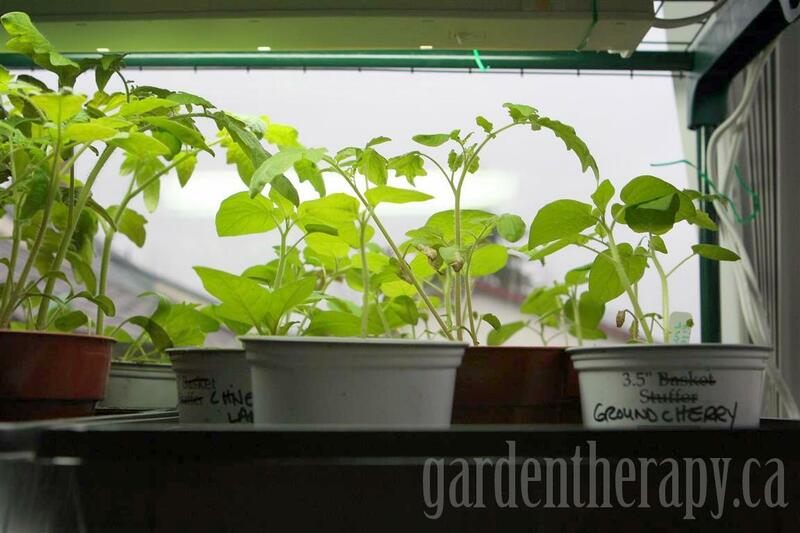 For more information on seed starting, please check out the other posts in this series: Seed Starting 101, Homemade Seed Starting Containers DIY Projects, The Best and Worst Store Bought Seed Starting Containers and Seed Starting Outdoors Under Umbrella Greenhouses. What is the brand of lighting units you used? Where can they be found? Thank you, Stephanie- this is exactly what I needed!